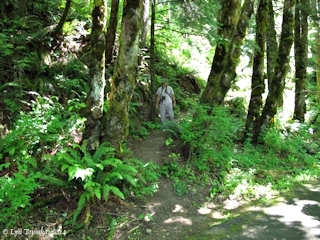 "Oregon Portage Road, 1856 ... "
Click image to enlarge East path leading to old remnant Oregon's 1850s portage road. Image taken June 5, 2014. A portion of the early 1856 Oregon portage road around the Cascade Rapids still exists today. Both the east and west end of this remnant can be reached from the Historic Columbia River Highway State Trail between Eagle Creek and the Toothrock Trailhead, east of Tanner Creek. Until the Cascade Canal and Locks opened in 1896, folks traveling up and down the Columbia River had to portage around the Cascade Rapids. Carts, trams, wagons, railroads, and military roads developed, with each end of the portage connected to Steamboats. In 1855 W.R. Kilborn built a portage road on the south side of the Cascade Rapids. Joseph Ruckel and Harrison Olmstead then took over operations and improved the road. By 1858 or early 1859 a lower level road known as the "Oregon Portage Railroad", constructed entirely of wood, began operation at the base of Toothrock. 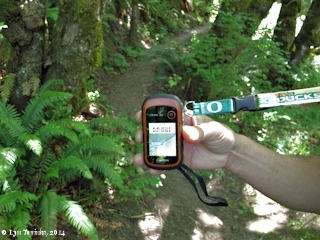 Click image to enlarge GPS, west path leading to old remnant Oregon's 1850s portage road. Image taken June 5, 2014. 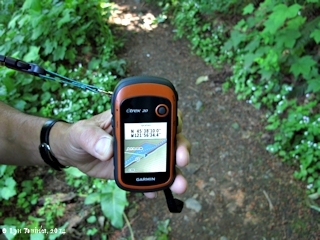 Click image to enlarge GPS, east path leading to old remnant Oregon's 1850s portage road. Image taken June 5, 2014. "[Samuel Lancaster said:] 'The first wagon road on the Oregon side of the Columbia river was completed Feb. 9, 1856 and ran from Bonneville to the Cascades.'" Source: Wm. H. McNeal, 1953, "History of Wasco County, Oregon"
"The first wagon road in the Gorge ran from the town of Bonneville to the site of the future Cascade Locks -- a distance of six miles -- and was completed in 1856. It climbed to an elevation of over 400 feet on steep grades around a portage at the Cascades of the Columbia River. This road only ran a short distance, however, and met the needs of a select few. Journeys on it, carrying supplies from Fort Vancouver to men stationed east of the Cascade Mountains, proved onerous." Source: USDI/NPS National Register for Historic Places Registration Form, Columbia River Highway, 2000. "... in 1846 all travelers seeking passage to the lower Columbia or Willamette Valleys halted at The Dalles, dismembered their wagons, loaded them upon rafts, and steering the rude barges down the Colubia to the Cascades, docked at the Cascades and portaged wagons and goods around the dangerous white water. Ropes, used as shorelines, guided the rafts to safety. The Columbia River water route continued popular both for passengers and for freight, and a portage road was constructed in 1856 to accommodate traffic. Rather than following the water level, later used by the railroad portage, the original wagon road around the Cascades, climbed 425 feet, a steep ascent for the plodding oxen used to draw cumbersome wagons. Toll roads later permitted the passage of cattle and pack trains, but it was not until 1872 that the Oregon legislature made a appropriation to construct a road through the gorge. The present highway has been developed from the narrow, crooked road built with that appropriation. A serious barrier to quantity freight transportation during the era when mining booms in Idaho and eastern Oregon made steamboat transportation on the Columbia a huge business, the Cascades were again mastered, this time at water level by a wooden-railed portage tramway over which mule-drawn cars, laden with merchandise, rattled from one waiting steamer to another. This proved so profitable a venture that steel rails replaced the wooden ones, and the Oregon Pony, first steel locomotive to operate in Oregon and now on exhibition at the Union Station grounds in Portland, was imported to draw the cars. The importance of the Columbia River as a traffic artery being established, the locks were later built by the Federal Government." Source: Federal Writers' Project, 1940, "Oregon: End of the Trail". "The first wagon road on the Oregon side of the river was completed on February 9th, 1856. It was less than six miles in length and ran from Bonneville to the Cascade Locks, passing over the top of a point of rock. The Portage Railroad was built at the base of this rock, which is the divide in the Cascade Range. The pioneer wagon road climbed to an elevation of four hundred and twenty-five feet on very steep grades to get by this difficult point. The new Columbia River Highway, which has no grade heavier than five per cent, passes around this point above the railroad, and below the old wagon road, at an elevation of two hundred and forty-five feet. Although diligent search was made, no record could be found that would show exactly who built this first road. A news item in the "Oregonian" of February 9th, 1856, reads: "We are informed that a new road around the portage of the Cascadaes, on the Oregon side, has been completed and that goods are now being transported over this road with safety and dispatch." On the same date an article appeared in the "Oregonian" calling attention to the fact that W.R. Kilborn, who resided at the Lower Cascades, on the Oregon side, had perfected "arrangements for the transportation of freight over the portage at the Cascades on the Oregon side." Continuing, Mr. Kilborn said, "The road is now in complete order and my teams will always be in readiness." The records in the United States Land Office at Portland show this road to have been in existence in 1859, just as it now is." Source: Samuel Christopher Lancaster, and others, 1915, "The Columbia: America's Great Highway Through the Cascade Mountains to the Sea, p.102-105. "F.A. Chenoweth built a portage tram road at Cascades (north side) in 1850 (P.W. Gillette in Quarterly, vol.v, p.121). The Bradford brothers (D.F. and P.F.) rebuilt the road in 1856. In the latter year W.R. Kilborn built a rival portage on the south bank, which was rebuilt and improved by J.S. Ruckle and H. Olmsted in May, 1861. The Oregon Steam Navigation Company absorbed the rival portages in 1862 and built a new portage on the north side in 1862-63 (opened April 20, 1863), six miles long. The Celilo portage was a wagon road until the Oregon Steam Navigation Company finished a portage railroad, thirteen miles long, April 23, 1863." Source: Leslie M. Scott, 1917, The Pioneer Stimulus of Gold, IN: The Quarterly of the Oregon Historical Society, 1917. Source: Frank B. Gill, 1924, "Oregon's First Railway, The Oregon Portage Railroad at the Cascades of the Columbia River", IN: "The Quarterly of the Oregon Historical Society", Vol.XXV, No.3, September, 1924. There seem to be no records extant, of those kept by Joseph S. Ruckel and Harrison Olmstead, the builders of Oregon's first railroad, or of their early contemporaries in the field of transportation. When the Bradford railroad on the north or right bank of the Columbia river was built, in 1851, this was in Oregon Territory, but as so very shortly afterward, the national government set up Washington Territory out of what had been North Oregon, the writer has considered it only consistent with the facts to speak of that means of transportation as the first railroad in Washington, and the first on the Pacific slope. ..."
"... The Fashion began again on a regular schedule shortly after the middle of July, 1855, at first twice a week, but later triweekly, between Portland and the Cascades (Oregon Weekly Times, July 21, 1855); the Wasco commenced her trips between the Cascades and The Dalles about August 1 and the Portland paper (Oregon Weekly Times, August 4, 1855) which announced the beginning of the Wasco's service, gave the news that a portage on the Oregon side of the river at the Cascades would be completed two weeks later. No subsequent mention of the new Oregon portage is found in the newspapers of 1855, but it may be concluded that some sort of a road with teams and wagons and storage warehouses was very shortly put into use for the transfer of business between the Wasco and the Fashion, as these steamboats continued to operate a through service between Portland and The Dalles, and the Bradford portage was in hostile hands." "Colonel Ruckel took up his residence at what was called the Middle Cascades, on the Oregon bank of the Columbia, and it would appear that he lived there for several years, until 1862. It seems also that he and his associates early acquired a contract for the transportation of government supplies, for the Oregon Weekly Times of March 8, 1856 referred to him as the "agent of the Quartermaster's Department at the Cascades." "The advantages of the newly constructed portage road were set out in the following advertisement which ran for a short time in the Portland Weekly Oregonian, commencing with the issue of February 9, 1856, and a news item in that issue stated that "a new road around the portage of the Cascades on the Oregon side has been completed and goods are now being transported on this side with safety and dispatch."" The undersigned having made arrangements for the transportation of Freight over the Portage at the Cascades, on the Oregon side, and having the necessary Teams, Boats, etc., will receive and transport with the utmost dispatch all FREIGHT, GOODS WARES AND MERCHANDISE by the steamers Fashion and Wasco and other conveyances. The Road is now in complete order. My teams will always be in readiness; good Warehouses have been erected, and my personal attention given to the business. Feb. 9, 1856. Lower Cascades, Oregon side. "This wagon road portage to be effective must have extended from the present station of Bonneville to the present town of Cascade Locks, but no details of its route or character seem to have been published. What became of Captain Kilborn, who had, we may surmise, built the road and its warehouses and provided its teams and boats, does not appear. The writer [Gill] has not found his name mentioned in the available literature subsequent to the time of the Indian attack upon the small settlements on the Washington side of the Columbia at the Cascades, in March, 1856, upon which occasion the Captain loaded the residents of the Oregon side in a large batteau and navigated them in safety down the river to the vicinity of Portland (Portland Weekly Oregonian, March 29, 1856). It is a fair presumption that he returned and continued operations on the Oregon portage wagon road, perhaps selling out later to Ruckel and his partners. The wagon road portage was evidently in use until near the close of 1858." "In April, 1856, the owners of the steamboat Belle having bought and rebuilt the wrecked Gazelle ... renaming her Senorita had substituted this larger steamboat for the Belle on the run between Portland and the Cascades (Oregon Weekly Times, April 12, 1856). Immediately afterward the United States government began, under the supervision of Lieutenant G.H. Derby of the Engineers' Department, the building of a military road around the Cascades on the Washington side (Portland Weekly Oregonian, May 17, 1856), and in that fall a coach was placed on this road by private interests, for the conveyance of passengers across the portage (Oregon Weekly Times, September 27, 1856). Further, Bradford & Co. were during the spring and summer of 1856 rebuilding and improving their portage railroad (Oregon Weekly Times, September 27, 1856), and before winter set in they had contracted for the building of a steamboat which they named the Hassaloe, larger than the Mary, and to operate in her stead between the Cascades and The Dalles (Oregon Weekly Times, November 3, 1856). These improvements stirred the less prosperous owners of the "Oregon Transportation Line", ... and Colonel Ruckel during the following season built the larger and more powerful steamboat Mountain Buck (Portland Weekly Oregonian, August 1, 1857) to replace the Fashion between Portland and the Cascades." "Unnoticed by the newspapers of the day, there had come into the Territory by this time one Harrison Olmstead, who became a partner of Ruckel in the control of the Oregon Portage. Olmstead acquired ownership of the land bordering on the Columbia river for a little over a mile, including the landmark known from its supposed resemblance to a double tooth (John W. Stevenson's statement to the writer.) as Tooth Rock, and the mouth of Eagle Creek. Ruckel became the owner of the next claim eastward, from the Olmstead holdings, partly in Multnomah county and reaching up the river bank past the so-called "Middle Cascades" where he built his home. Below Olmstead's acquisition, and embracing the present station and picnic grounds at Bonneville, John C. Tanner had his claim. Above the Ruckel land was the claim of John Chipman, including the sites of the afterward constructed government canal and locks and the settlement now called Cascade Locks. While the Ruckel and Olmstead properties really controlled it, the Tanner and Chipman claims were needed for full ownership of the portage and were eventually purchased by the owners of the central portions." "On this first day of September A.D. 1857, before the undersigned Clerk of the District Court for the 2nd Judicial District of Oregon personally appeared, John Chipman, J.S. Ruckel and Harrison Olmstead each and all personally known to me to be the persons whose names are subscribed to the foregoing instrument of writing and who signed, sealed and delivered the same, and acknowledged that they signed, sealed, delivered and executed the same freely and vountarily for the uses and purposes therein set forth. Witness Jas. W. Davis, Clerk and the seal of said Court affixed the day and year above written." "I hereby certify that I have this 28th day of August A.D. 1858 recorded the within lease at length in Book A, page 150 and forward in the records of Wasco County, Oregon. W.C. Moody, Auditor and Recorder." "... the prospect of a railroad on the Oregon side, which was going to extend, if constructed, along the full length of the four and one-half mile portage ..."
"The survey and detailed plans of the Oregon Portage Railroad were made by John W. Brazee (Bancroft, History of Oregon), a civil engineer of Portland afterward for twenty years in the service of the Oregon Steam Navigation Company ... Brazee superintended the construction of the Railroad, a necessary part of which was the Eagle Creek sawmill operated by water power drawn through a flume from that stream. Close by the sawmill a headquarters building, used as a residence by the superintendent but accomodating the employees of the mill and the railroad, was built, and other structures were erected for housing the horses and mules that drew the little four-wheeled cars with which the Railroad was provided. There was one passenger car, covered in to protect the passengers in the event of rain or cold weather, and the mules were driven tandem fashion, three or four being, if the occasion warranted it, attached to the train (John W. Stevenson's statement to the author [Gill])." "The Railroad itself was constructed entirely of wood, which it may be assumed was supplied by the Eagle Creek sawmill; the rails were of fir, in sections six inches square and laid at a gauge close to, if not actually five feet, as indicated by the photographs of the line which have been preserved. The space between the rails was covered with planking and the bridges on the line were solidly constructed for the loads they were expected to carry, that at Eagle Creek being a framed cantilever and the others framed trestles. There was a large amount of bridging, because it was a great deal less expensive to draw upon the adjacent forests for timber than with the methods then available to build up earth embankments. The Oregon Portage Railroad was built over the small rocky elevation which marks the eastern end of the present Bonneville station grounds, through which barrier the Union Pacific trains now dash. Between this point and the western bank of Eagle Creek the traveler passes the Tooth rock, whose base was then washed by the Columbia at least during flood stages, and this depression was crossed by a heavily built trestle where today is a solid embankment." 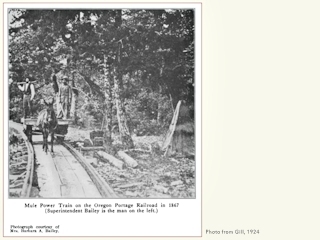 "It is not clear at what time the Oregon Portage Railroad was first operated, but it seems a fair conclusion that it was in use late in 1858 or early in 1859, the next reference to it which has been found being included in the Portland Advertiser of June 14, 1859. Speaking of unusual high water in the Columbia river this newspaper records that "at the Cascades the water has risen above the mark of 1853, and swept off about 300 feet of Ruckel and Olmstead's Rail Road near the upper warehouse and all of the bridge around the Big Tooth near the Lower Landing: damage estimated about $10,000". 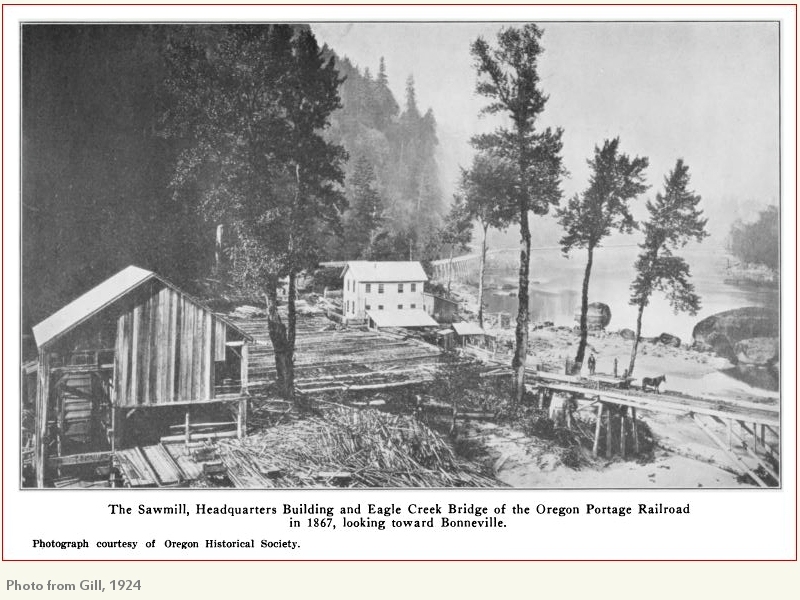 Clearly, therefore, by this time the Railroad had been built from the upper landing at the present town of Cascade Locks to the lower landing at or near the mouth of Tanner Creek, just west of the present Union Pacific station of Bonneville." "John Stevenson and his sister, Mrs. Bailey, say that it was common, sixty years ago, to speak of the Oregon Portage Railroad, the "Ruckel Railroad" as it was commonly known, as built without a dollar. By promises of payment, rather than with cash, Ruckel, they say, persuaded men to work for him in the building of the railroad. ..."
"At last the repairs were completed, or nearly so, and the railroad was in condition to be operated, the Pacific Christian Advocate of May 11, 1861, stating that Ruckel and Olmstead's railroad at the Cascades is completed and in a condition to carry freight from the upper to the lower landing. Four cars are now in operation upon the track. A wharf boat has been placed at the upper landing for the reception of freight. This road is a valuable improvement ..."
"The transit of freight and passengers over the Cascade portage is now on the Oregon side of the Columbia. The new rail-road of Col. Ruckel's is near completion and freight has to be hauled only a few hundred yards from the lower terminus. The length of the road will be four miles and it is well constructed, with every desirable facility for transferring freight to The Dalles Steamers."" "John Chipman deeded his donation land claim at the upper landing to Harrison Olmstead on August 31, 1861, and John C. Tanner deeded his land at the lower landing to Olmstead on November 15, 1861; these conveyances put the entire portage property in the name of Harrison Olmstead." "The Dalles Mountaineer was quoted in September, 1861 (Portland Weekly Oregonian, September 28, 1861), as stating that "Colonel Ruckel's rail road at the Cascades is in complete order and *** one hundred tons can be sent over it daily."" Click image to enlarge HISTORICAL PHOTO, "Mule Power Train on the Oregon Portage Railroad in 1867". From: Gill, 1924. Original photo courtesy Mrs. Barbara A. Bailey. 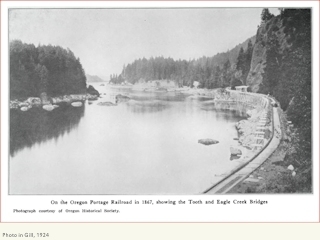 Click image to enlarge HISTORICAL PHOTO, "On the Oregon Portage Railroad in 1867, showing the Tooth and Eagle Creek Bridges". From: Gill, 1924. Original photo courtesy Oregon Historical Society. 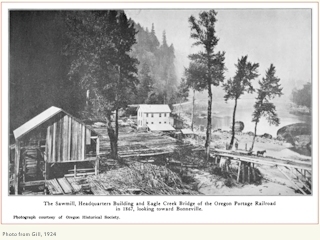 Click image to enlarge HISTORICAL PHOTO, "The Sawmill, Headquarters Building and Eagle Creek Bridge of the Oregon Portage Railroad in 1867, looking toward Bonneville". From: Gill, 1924. Original photo courtesy Oregon Historical Society. 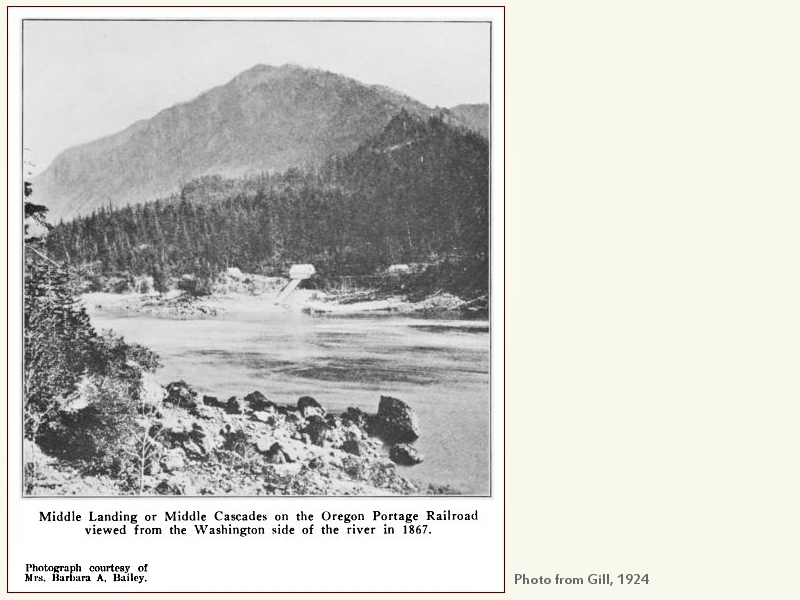 Click image to enlarge HISTORICAL PHOTO, "Middle Landing or Middle Cascades on the Oregon Portage Railroad viewed from the Washington side of the river in 1867". From: Gill, 1924. Original photo courtesy Mrs. Barbara A. Bailey. Gill, F.B., 1924, "Oregon's First Railway, The Oregon Portage Railroad at the Cascades of the Columbia River", IN: "The Quarterly of the Oregon Historical Society", Vol.XXV, No.3, September, 1924.